This "Historically Speaking" column appeared in the Exeter News-Letter on Friday, November 11, 2017. Catching up with the news in the 1940s meant checking headlines in the paper, listening to the radio or going to the movies. Newsreels were shown before the feature films – one of the most popular series was called the ‘March of Time,’ which premiered in 1935. Created by producer, Louis de Rochemont, who frequently served as director, these short documentaries focused on current conditions and events. The Academy of Motion Pictures awarded the ‘March of Time’ series an honorary Academy Award in 1936, for “having revolutionized one of the most important branches of the industry – the newsreel.” De Rochemont was on hand in Hollywood to accept the award from Bob Hope. Although he traveled the world with his newsreel crew, de Rochemont remained a New Englander. He settled his family in an old farmhouse in Newington and made New Hampshire his home base. In June of 1941 the Exeter News-Letter announced, “our little town is to play an important role in a ‘March of Time’ production which will seek to portray, with photographic accuracy, a study of New England – its customs, people, industries, and landmarks. Shot during the summer of 1941 – before the United States was involve in World War II – the newsreel focused on the more folksy aspects of town life. Local people were used to highlight our town selectman form of government, police and fire departments, church life and local economy. To watch the film today, and you can simply by going to YouTube or the HBO online archives, it’s a wonderful snapshot of Exeter in 1941. There are a few glaring manipulations – you will only see men working in the factory scenes (women worked in both the shoe factories and the Exeter Manufacturing Company cotton mill) – and there are no people of color to be seen – but the landscape of the town is pretty much the same today as it was in 1941. The film premiered in Exeter at the Ioka on July 2nd, 1941. There’s a great scene in the film where Ned and Henry Shute, both Exeter notables, tell tales of Exeter News-Letter editor John Templeton. Ned recalls, “I remember him once telling me, ‘Ned, I can forgive a man for beating his wife, but not for splitting the Republican ticket.’” That story probably wouldn’t go down so well today. Women in town were, according to the film, members of the Garden Club and churches. Florence Rowe has one of the few speaking parts as she faces down some stony-faced club members to declare, “we are not going to have billboards in beautiful New Hampshire.” Check it out, it’s the most New Englandy thing you’ll see all week. De Rochemont returned with his film crew in January of 1948 to film ‘The New England Story’ in conjunction with the U.S. State Department. The film, which is nearly unavailable today outside of the Keene State film archives, is similar to the ‘March of Time’ in its explanation of our way of life. It featured the life of local man, Lawrence Bond, who lived in Newfields. His work at the Exeter Manufacturing Company and desire to start a home egg business are the main feature of the film. Longer than ‘New England’s Eight Million Yankees,’ the film was translated in 14 languages and shown around the world. After the war, de Rochemont turned to producing films, often with his son as director. His feature films still have the look of his documentary work. In 1951, the town was excited to learn that de Rochemont would be filming some scenes of ‘The Whistle at Eaton Falls’ in Exeter. As was his custom, local people were cast and Ned Shute is clearly visible in the opening scenes. The Swasey Bandstand can be seen throughout the film, but the factory scenes, filmed at the Exeter Manufacturing Company, are all exterior shots. The film, which starred Lloyd Bridges, Ernest Borgnine and Lillian Gish, depicts a small town facing lay-offs due to automation. The local shoe shops have already closed throwing the town’s economy into disarray. Bridges character, a union man, is unexpectedly hired as the new president of operations. This leads to social drifting away from his peers, a desperate attempt to adapt the factory to keep all the employees and a wildcat strike. The story was greeted with indifference by most local viewers. Helen Tufts commented, “saw various familiar people in it – Hazel etc. Disappointed in it tho,” in her diary. Lib Ring still recalls going to York to film the square dance sequence. “My husband and I were in the original uncut version of the film.” To see ‘A Whistle at Eaton Falls’ you need to keep an eye out. It occasionally pops up on classic movie channels. The original is held, like ‘The New England Story’ in the film archives of Keene State College. The next chance to see it is at a special viewing on November 14 at the Redfern Arts Center. The de Rochemont family donated most of the collections of Louis de Rochemont to the college in 2010. Later in his life he became more involved in local politics – you can thank Louis de Rochemont every time you navigate the Portsmouth traffic circle. Here in Exeter, he left us three films that are time capsules of our history. 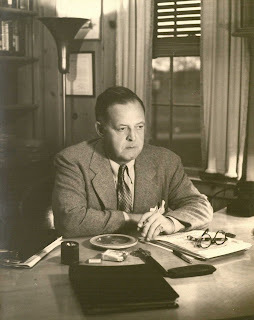 Photo: Newington film producer and director Louis de Rochemont, Jr. (1899 – 1978). Photo is courtesy of Keene State College Special Collections.